Somebody gets a big fat F for summer blog keeping........and it's me!!! Summer has been an absolute blast!!! There were some serious real down lows but, the up high highs couldn't be better!!! We spent the better part of August on vacation since I'm pretty sure this is my 'last summer of freedom'. Hampton Beach Maine was our first fun stop with the in laws and cousins. We had a great time!!! 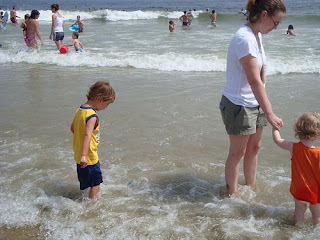 This was the first time Jeremiah has ever seen the ocean and I really should have taped it! It was hot out yet still a little foggy. We all took off our shoes and stepped onto the sand. Jeremiah says, "Oh wow, Mom! That's dirt!" I explained that it was sand and he responded with an "Oh!". He then looked up and pointed at the ocean and said "And a big pool!!!!" The newness is so fun to watch, that's for sure!!! Here's a picture of the excitement! I also started, this summer, with the Post Office delivering mail. That in and of itself is a story and a half!!! I'll probably spare the details.....I just have to say that it is a God given job, that's for sure!!! I'm loving every minute of it and am thrilled that I am once again waking at 5am.....something I haven't been doing since I got pregnant!!! There was a very peaceful still time in my life when I would wake up at 5am, get ready and get to work and be in bed by 9 to read for an hour. I'm almost back on that same schedule and I feel so refreshed........like it's exactly what I needed. There's just something about the sunrise in the morning that makes the whole day that much smoother! Well.....I'm off to get a horrible set of towels off of the Compact! I probably should take pictures....they are that bad! Great to see you back! If you get an "F" for summer blogging, I get a "D-"! Actually, I should probably get an "F" because I haven't woven anything. I have been too busy moving and recovering from moving.